These nutty little beauties are cupcakes I made for a competition in the newly launched Taste Magazine. The idea is to 'cook the cover' and share the results on their social page. Let me just say... I love this new magazine! It's beautifully designed and the food photography is gorgeously styled. It reads like your favourite food blog and the contributors are all well known Australian food personalities. In fact, Adriano Zumbo gives up his recipe for his famous Zonuts, his riff on the notorious Cronut. Awesome! 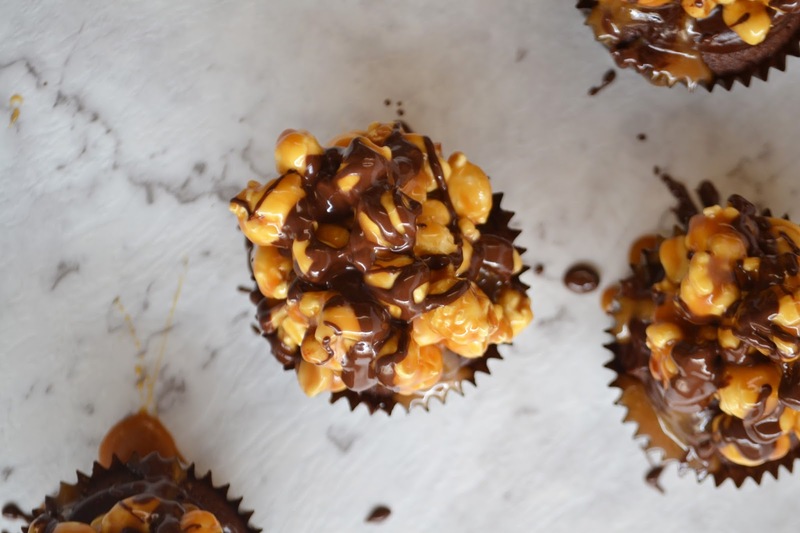 These decadent chocolate cupcakes are topped with chocolate frosting and a glistening mound of Lolly Gobble Bliss Bombs and salty peanuts, bound with salted caramel. Good Lord! For those not in the know; along with Twisties, Tim Tams and Vegemite, Lolly Gobble Bliss Bombs are the quintessential Aussie snack food. Popcorn and nuts, all coated in crunchy caramel. So good! The recipe for these babies can be found in the new September issue of Taste Magazine, on sale now. In the meantime, here's my recipe for the ultimate chocolate cupcakes! These cupcakes are insanely good! They're decadent and deeply chocolatey. They're not super duper sweet so they pair well with all types of frosting; from ganache to buttercream to fluffy meringue icing. Sky's the limit! I love topping these with a lush Salted Caramel Italian Meringue Buttercream. Preheat oven to 180ºC and line two cupcake pans with paper cases. Combine the dry ingredients in a bowl (flour, sugars, cocoa, baking powder, soda and salt). Dissolve the coffee in a teaspoon of warm water. Mix together the yoghurt, coffee mixture, eggs and vanilla in a jug and set aside. In a large bowl, combine the butter, oil and cold water and mix with a hand-held mixer till combined. Add the dry mix and beat on a low speed until the dry mix is incorporated. Slowly add the yogurt mix, beating at a low speed all the while. Mixture should be the consistency of pancake batter. Using a large ice cream scoop, divide the mix between the cupcake pans and bake for 15 minutes or until a skewer comes out clean. Cool on a wire rack and frost when thoroughly cooled. Enjoy! Yay! A fellow Aussie! The new Taste Magazine is truly fantastic... is it sad that I'm looking forward to the next issue already? Let me know how your cupcakes turn out. My big tip though: buy two bags of Lolly Gobbles; one to top the cupcakes and one to munch on! PS: How addictive is Food Gawker? I visit FoodGawker multiple times a day! Cannot get enough! Oh, I just had another look at your pictures and just realized we used the same cupcake papers (Coles, right?)!! Oh, your cupcakes look amazing! Our cupcake liners are indeed twins... the Coles patty cases are great; no fading at all! I've just been scoping out your blog and nearly had a conniption when I saw your post on Biscoff spread being available in Australia. But alas, no dice; it's sold out everywhere! Next time! I was lucky enough to get 2 jars before one of the shops ran out! Just keep checking them; they'll get them in stock again eventually. Unfortunately though, it's usually a long wait. Have you tried Biscoff spread before? Haha I actually haven't tried it before. I've had Biscoff cookies before (my hairdresser stocks them, bless her!) but truth be told, I'm just a massive lemming when it comes to food trends! I've featured this gorgeous cupcakes on my blog, hoping that you don't mind, but if you do, please contact me and I'll remove it. All the best. That's more than fine! Thank you for the kind words! Where is the frosting recipe for this cupcake? Nice to be able to make that too. Thank you!